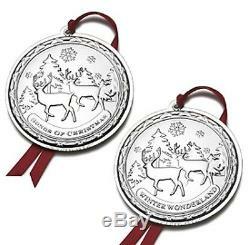 2011 Wallace Winter Wonderland Song Sterling Silver Christmas Ornament 12th Edition. This s3terling collectible Songs of Christmas Ornament is the 12th and final edition in this annual series from Wallace. This limited edition collectible embodies the magic of Christmas through the joy of its songs. A nature scene, with "Winter Wonderland" is embossed on this exquisitely crafted keepsake, sure to become a family treasure for generations to come. The size is about 3.25 High. Picture shows front and back sides. Original gift boxed with a storage pouch, and certificate. It is marked Wallace Sterling. Wallace sterling ornaments are proudly made in the USA. Most of the time they have never been opened. It is important for you to know that old new stock , can and will tarnish. That is the nature of Sterling Silver. The item "2011 Wallace Winter Wonderland Song Sterling Silver Christmas Ornament 12th Ed" is in sale since Saturday, October 08, 2016. This item is in the category "Collectibles\Holiday & Seasonal\Christmas\ Current (1991-Now)\Ornaments\Other Current Tree Ornaments". The seller is "thegolfingdolphin" and is located in Port Charlotte, Florida. This item can be shipped to United States, Canada.